FTP file services on OES 2015 SP1 servers are provided by Pure-FTPd, a free (BSD), secure, production-quality and standard-conformant FTP server. The OES implementation includes support for FTP gateway functionality as on NetWare and offers a level of integration between eDirectory and Pure-FTP that allows users to authenticate to eDirectory for FTP access to the server. The OES implementation also includes support for FTP gateway functionality between Active Directory (AD) and Pure-FTP that allows users to authenticate to AD for FTP access to the server. For more information, see FTP (Pure-FTPd) and OES 2015 SP1 for AD Users in the OES 2015 SP1: NSS AD Administration Guide. To install Pure-FTPd, select the Novell FTP pattern in the OES 2015 SP1 installation. If DefaultHomeDirectory path is a POSIX path (non NCP volume) then it is supported only on local FTP server and not on remote server. In that case DefaultHomeDirectory path should be /home/commonpath (any POSIX path) and DefaultHomeDirectoryServer should be Null or commented. To configure the Pure-FTPd server on OES 2015 SP1, edit the /etc/pure-ftpd/pure-ftpd.conf file. For step-by-step information on setting up Novell Cluster Services, refer to Installing, Configuring, and Repairing Novell Cluster Services in the OES 2015 SP1: Novell Cluster Services for Linux Administration Guide. Enable hard links on the shared NSS volumes. For more information on hard links, see Hard Links Commands in theOES 2015 SP1: NSS File System Administration Guide for Linux. 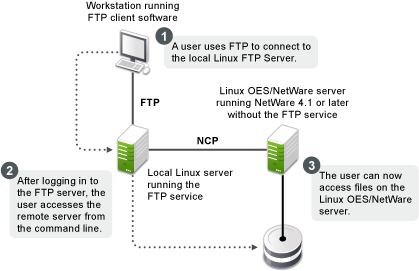 You can also migrate an existing FTP server configuration from a NetWare server to OES 2015 SP1. For migration instructions and a brief FAQ, see Migrating FTP to OES 2015 SP1 in the OES 2015 SP1: Migration Tool Administration Guide.